Goal: An economy that is competitive, diverse, and attractive to business; that maintains and expands assets and capital; that provides a variety of entry-, middle-, and high-level jobs; and that promotes the well-being of New Jersey’s communities and its workforce. The economy is an engine driving activity in the state, particularly our impacts on the environment and the quality of our social systems and support networks. 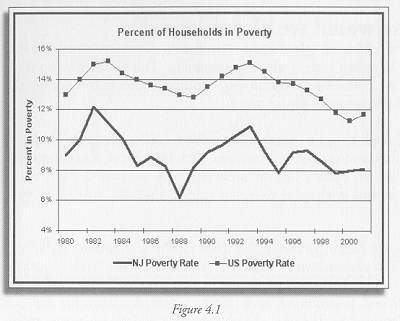 New Jersey’s economy underwent a major transition in the second half of the twentieth century, moving away from dependence on manufacturing and heavy industry, and towards dependence on advanced technology and services. With this transition, we have come to rely more on manufactured goods imported from other states and countries. While some see local (or state-level) self-sufficiency as a key component of sustainability, others focus on the potential for greater well being that can result from national and global economic interdependence. New Jersey is, on the whole, a prosperous state. Per capita disposable income is consistently among the highest in the country, our unemployment rate is relatively low even with the recent recession and the share of households below the poverty line is consistently well below the national average. However, there is still significant income inequality, and great racial and ethnic disparity with respect to economic well-being. 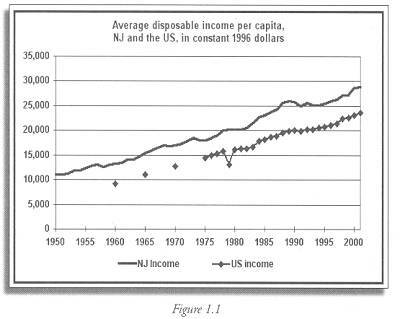 Per capita disposable income continues to rise, based on the most current data available. 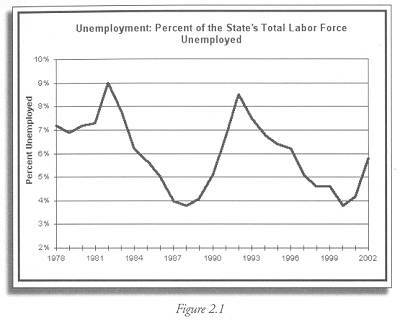 Unemployment rose in recent years. Services and trade continue to rise as a share of employment, while manufacturing continues to drop. 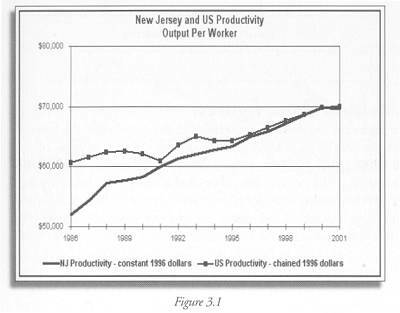 Productivity of labor, or gross state product per worker, continues to rise steadily. Share of households below the federal poverty line has risen since 2001, although it is still well below the national rate. 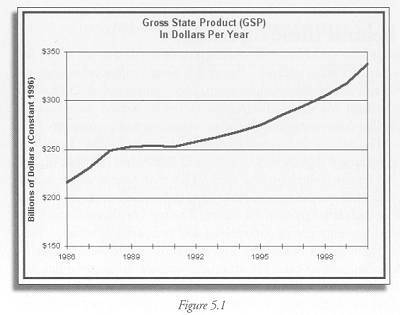 Gross state product continues to rise steadily. 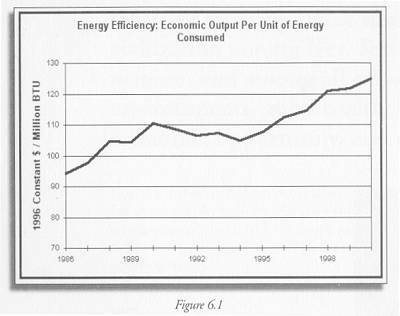 Economic output per unit of energy consumed continues to rise steadily. 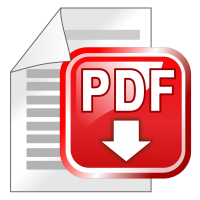 Our economic data capture transactions that pass through the economy – that is, anything that is sold for money. Though economic indicators are often used as if they measured welfare or the quality of life, in fact they capture only some of the elements of those elusive concepts. They do not capture the harm people cause each other – pollution or crime, for example. They also do not differentiate between things that we buy because they benefit us directly – food, housing, or gifts – and things we buy to cope with the harm we cause each other – brownfields cleanup, or security systems. More comprehensive data on these issues would provide a clearer understanding of our economic well-being.